Last month as Ramadan started, Chinese authorities moved into action. 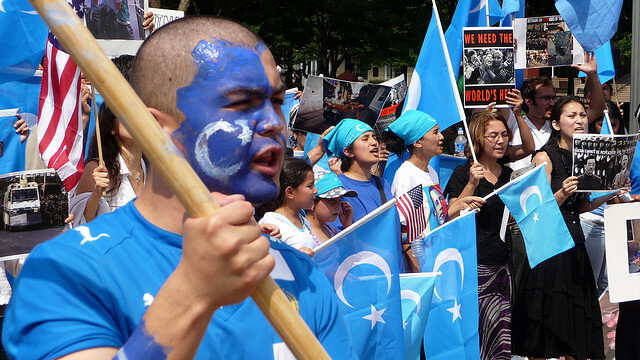 Their plan: no Ramadan for China’s minority Uyghur population. The Uyghurs are a Turkic muslim ethnic group living primarily in the Xinjiang Uyghur Autonomous Region in China, where they are one of 55 officially recognized ethnic minorities. The Chinese government has long manipulated the threat of terrorism to justify its crackdown on the 10 million ethnic Uyghurs in Xinjiang. Human rights violations documented by Human Rights Watch in recent years include broad denial of political, cultural and religious rights, torture and enforced disappearances, extensive censorship, and pervasive socio-economic discrimination. Recent rules have forbidden all but elderly Uyghur men from growing beards. Women are prohibited from wearing burqas. People under 18 are not allowed to attend mosque. The new ban on fasting now also reached Turkey, home to an estimated 300,000 Uyghurs. Turkey’s foreign minister released a statement that said, „Our people have been saddened over the news that Uyghur Turks have been banned from fasting or carrying out other religious duties in the Xinjiang region.“ In return China issued a travel warning to citizens traveling to Turkey. As often in historic conflicts there is no simple solution. On one side Turkey won’t forget the deportation of 109 Uyghurs, in black hoods, being taken to the plane and disembarking in China. On the other side there are Uyghurs who have left China and joined Islamic extremist groups in Pakistan, Afghanistan, Iraq, and Syria. The ban on fasting seems like a helpless attempt by the Chinese government to handle a conflict that goes ways deeper and has international dimensions.